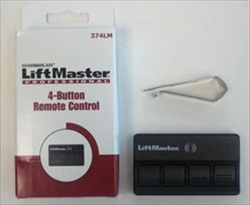 Liftmaster Sears Chamberlain 374LM 4 button garage door remote control transmitter. No longer available. See the 894LT for replacement. Works with all Liftmaster, Sears and Chamberlain garage door openers, utilizing the 315 Mhz frquency. Works with garage door openers that have a purple programing button and yellow indicator light. Works with Liftmaster models 3850, 3595, 3585, 3575, 3280, 3265, 3240, 3255, 3245, 3130, 1355, 1345. Original factory replacement part. Color: Black, 3 volt lithium battery, part #374LM.